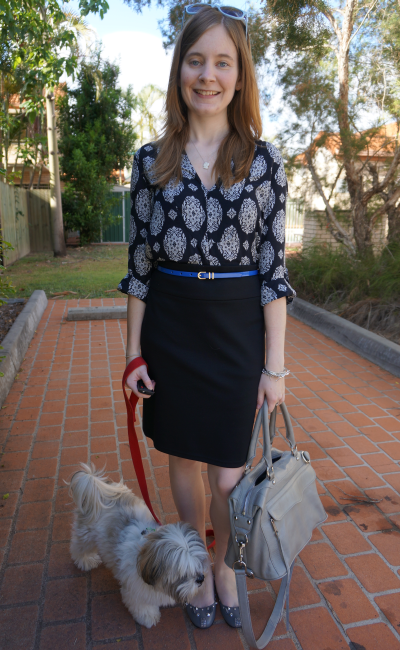 Linking up with Spotlight Weekly, Three-fer Thursday, What I Wore To Work, Fashion Informant today. Last worn: Zara blazer, red Asos dress, glitter flats, Marco Tagliaferri bag. Have been wanting to wear this dress as a top for a while. Figured that now was the best time to wear it, before the weather gets too warm! Have had a few cooler weather outfits planned in my head for a while despite the heat, as I was due to fly overseas for work on Saturday, to a cold climate. I'm unfortunately no longer travelling as planned. I know if the chance comes up again though, I've got my outfits planned and my suitcase all packed in my head, ready to go, haha! Lots of people have been asking about my mini MAB on youtube, so I made a short review and 'what's in my bag' video. Last worn: blue sunglasses, printed Zara tunic, black pencil skirt, studded mouse flats, Rebecca Minkoff MAM. Love that first dress with a little tweed jacket! Nice combo! LOVE the red dress on you!! You look so pretty in the first outfit..my fav!! I like the jacket paired with the red dress and the 2nd outfit...I love the pop of blue! i LOVE tulip shaped skirts and dresses. Plus it's the color red! Looks amazing Mica. I love it. Ahh That Marco Tagliaferri has been on my wishlist for ages! It looks amazing with your red dress (which is absolutely magnificent, I may add!). 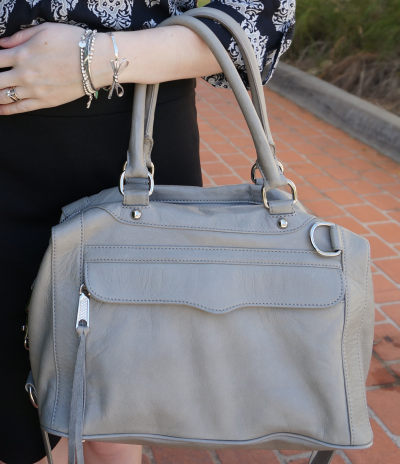 Love yesterday's bag and flats, and both outfits are lovely! The dog is the cutest accessory ever! You look so lovely in both outfits. I love the jacket in the first picture, I've always liked that sort of effect with clothes. Thanks! Had to try do something to find storage space for all my bags, my wardrobes are overflowing like crazy, haha. The blue belt really sets off the black skirt and black/white dress as a top. Looks great! I love both looks, but that red dress and tweed jacket are so fun for this season! Thanks for sharing your look with Three-fer Thursday! You got a Rebecca Minkoff bag, omg, how awesome is that? Love your red dress, I think it looks so nice on you! Dropping by from the Three-fer Thursday Linkup! I love the top in your second look, such a great print! The red dress looks so beautiful on you and the jacket looks great with the dress. The second outfit is also so classic and lovely! Hello dear, wonderful blog and nice outfit :) love the dress red ;) I follow you with pleasure ;) if you want to pass me by! Oooh, I love a pretty red dress, and this is definitely one such dress! I love your work dress! its so cute! That red dress is really pretty on you! Great look and you seriously have all the best bags!! LOVE! That red dress is a winner! Great shape and colour. that red dress looks gorgeous on you! and i love the way you styled it! You look absolutely gorgeous in red! Love all the outfits. So vibrant and perfect pattern on the blouse. You find some brilliant pieces. Have a great weekend. love these outfits, so fabulous!! wearing the dress as a top is such a clever way to remix it. the print is so gorgeous, i can see wanting to wear it as much as possible!